Are you dedicated to a healthy lifestyle? A swim spa is the perfect fit. Most of us know swimming is a low-impact exercise that can help improve cardiovascular health. The ability to exercise in a swim spa, whether gently in place or more rigorously against a swift current, is convenient in many ways. Let’s look at how swim spas provide year-round fitness. Swim spas are a small footprint vessel typically made of acrylic and fiberglass or steel walls, a vinyl liner, and custom concrete. They are designed around the swim current that’s created by powerful jet pumps. They produce a flat and uplifting water flow to allow bathers to swim continuously up to eight mph without turning. The degree of resistance is variable – typically controlled by a simple dial. So, swimmers can determine the pace. 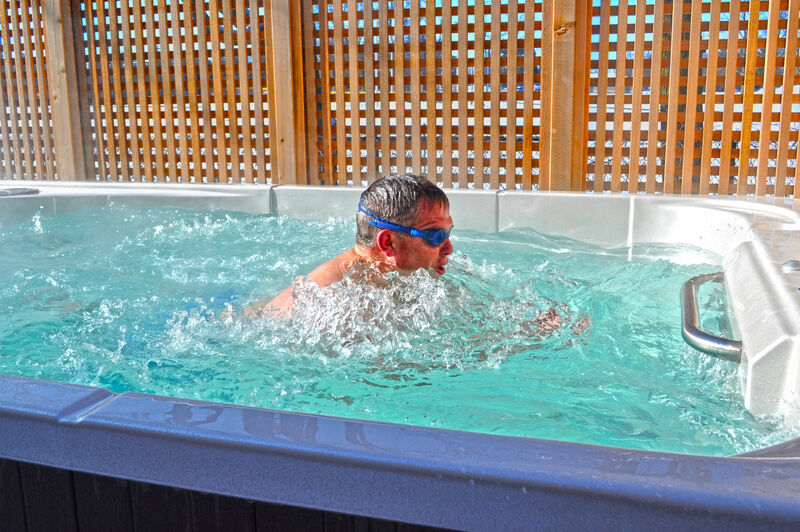 Swim spas are fun and safe for all ages, shallow enough for most children and non-swimmers, yet deep enough to satisfy the most serious swimmer, jogger, or water aerobics enthusiast. You know there are many benefits to exercising in water. Aquatic fitness allows bathers to exercise every muscle and joint in the body at the same time. Furthermore, working out in a swim spa helps keep the body cool, opposed to land-based exercises. The water lowers body temperature while you’re working out. One of the most important benefits of doing water aerobics in a swim spa? Practically anyone – no matter their age – can do it! This is because water makes the body buoyant. Plus, there’s less strain and stress on joints and muscles. Lets you have control. Easily set and change the pace of the workout. The water cools your body, and your heart rate is slightly lower. This means aquatic fitness is relatively safe for obese individuals, pregnant women, and those suffering from hypertension and heart disease. You don’t need to know how to swim to take advantage of water aerobic exercises in a swim spa. Bathers can wear one of many devices to enable them to stay afloat with little effort. This in turn, allows the bather to concentrate on his/her routine. 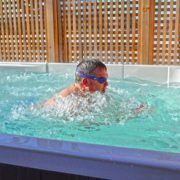 The ideal location to perform water aerobics is in a pool or swim spa with a thermal cover, which allows you to control the water temperature. It is best to have the water temperature between 77 and 95F, which is lower than the body’s temperature (98.6F). Swim spas are great for people who are looking for something bigger than a hot tub yet more functional year-round without the expense of installing, operating, and maintaining a pool. In addition, with water volumes of 2,642 gal or less, owners will be happy to know the cost of electricity and water care products are also much lower than a traditional pool. Whether you are young or old, fit or not so fit, using a swim spa to perform aquatic exercise can help you live a happier lifestyle. You can manage a healthy weight, toning and maintaining bone density, and relieve physical and mental stress. Owning a swim spa is like having your own aquatic gym in the privacy of your own backyard. Today’s financing options make it affordable to own with monthly payments. Arvidson Pools & Spas offers a full line of Hydropool Swim Spas ranging in size from 14’ to 19’ and a variety of models to match your fitness and relaxation goals. After an aerobic water workout, take a break and let the jets of the spa soothe your muscles. The beauty of a swim spa is that it combines the benefits of a water work out with the relaxing hydrotherapy of a hot tub. It’s the best of both worlds! 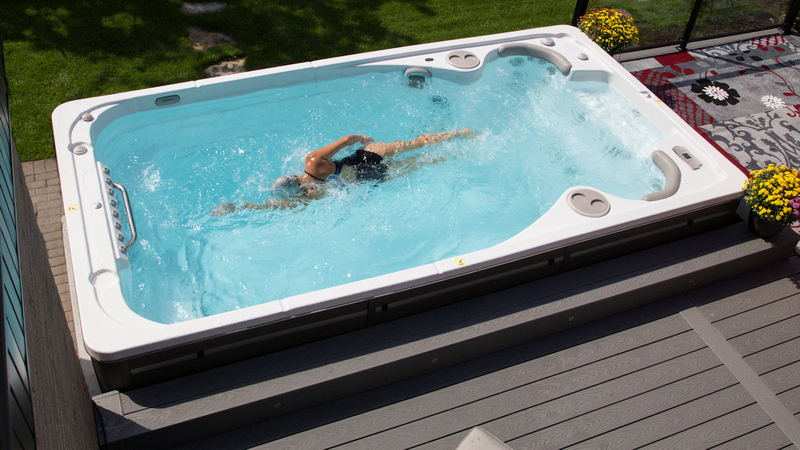 Visit our stores in Crystal Lake and Palatine to see the Hydropool Swim Spas in person. You can also schedule a test swim for a first-hand experience on the smooth current these swim spas provide. Isn’t it time to get out of the house and into the water with a new Hydropool Swim Spa from Arvidson Pools & Spas? We are here to help make that happen.